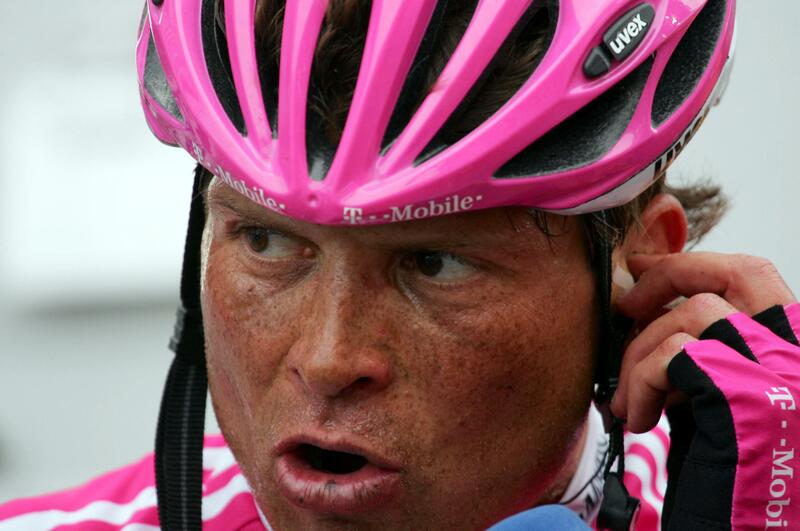 What made T-Mobile so quickly sever its relationship with Jan Ullrich? What's been shown to teams so far is the 38-page summary of the 500-page Spanish Civil Guard report, and it turns out that Spanish Civil Guard authorities had phone and SMS records that appear to show a chain of communications between someone calling himself “Rudicio” and Dr. Eufemiano Fuentes. Late on May 17, Fuentes got an SMS message from “Rudicio,” trying to set up a conversation. The next day, around noon, he got a call from the same number, and told the caller he was busy, and could talk that evening. “But there's a time trial,” the dossier quotes the caller as saying. Ullrich's longtime trainer is Rudy Pevenage, and on May 18, Jan Ullrich won the Giro time trial. Additionally, the codename ‘Jan’ (and I hope we somehow find that these guys weren't so dumb as to think ‘Jan’ is a good codename for someone named, um, ‘Jan’) is 4 times listed in a lab document concerning stored blood, human growth hormone, insulin-like growth factor, and testosterone patches. At Ignacio Labarta's home, police found documents on Francisco Mancebo's annual training regimen, with symbols the police recognized from other lab documents as relating to blood transfusions and medicines, and which the Civil Guard claims identifies Mancebo as client number 17 on the numbered blood bags. Oscar Sevilla, Santiago Botero, and Jorg Jaksche were allegedly seen arriving with Fuentes and Labarta at an apartment where “four bags of blood were refrigerated.” I don't know if they mean the four bags were found when the raids went down, but I assume that's the implication. As for Basso, the case against him seems more circumstantial: Investigators claim Labarto referred to him, and José-Enrique Gutierrez, on the phone with Fuentes as Fuentes clients, and the Civil Guard then made the link with the codename “Barrillo,” Basso's dog's name. Manolo Saiz apparently established the relationship between Roberto Heras and Dr. Fuentes. When he was questioned May 24, Saiz told Spanish officials that Heras insisted on using Fuentes as his team doctor, over the objections of Saiz. That seems a little strange, given that Heras is out of the sport, but Saiz was still involved with Fuentes. Finally, officials claim they found references to Joseba Beloki in a lab document with notations for HGH, IGF-1, testosterone patches, EPO, anabolic steroids, and blood transfusions. Phonak finalized its Tour squad Sunday, making good on the team's promise to exclude Santiago Botero and Juan Enrique Gutierrez until the Operación Puerto investigation shakes out. Without Botero and Gutierrez, two riders who have gone Top 5 in a grand tour, Phonak has riders from 9 different countries focused on placing Floyd Landis of the United States as high as he can climb. South Africa's Robbie Hunter is already back from a shoulder and hand injury suffered a month ago at the Volta a Catalunya, and reports that he's free of pain. Axel Merckx of Belgium is riding his 7th Tour in what may be his final season, and Nicolas Jalabert of France starts his 8th Tour. If the two should be dropped before the Tour, Phonak would lose two of its three strongest Tour riders. Labarta resigns: Will it save CV's Tour spot? Labarta is reportedly one of the figures involved in a blood doping operation headquartered in Madrid that is currently under investigation. "If we are not in the Tour it will be the biggest injustice that can be committed in the world of cycling," Belda told reporters at the Euskal Bizikleta bike race. "We have a clear conscience. We hope the bad news stops right there. We´ve been doing things the past few years as they should be done. We have nothing to hide and have nothing that can make us guilty." Eurosport also cites claims in the Spanish magazine Interviu that investigators taped clinic visits by Phonak's José Enrique Gutierrez and Santiago Botero, T-Mobile's Oscar Sevilla, and Liberty Seguros' Angel Vicioso, all of whom raced for Kelme when Eufemiano Fuentes was the team doctor. Sevilla's T-Mobile team manager, Olaf Ludwig, is quoted on the team website that Sevilla “confirmed to me by phone that he hasn't had any contact with Fuentes.” As for the taped visits to the clinic? “The doctor he worked with had a clinic in the same building as Fuentes,” says Ludwig. Ivan Basso flashed a picture of his newborn son Santiago as he crossed the finish line with a Stage 20 victory today, leading Gilberto Simoni across the line by 1:18. Basso again showed an extra gear that no one else could match. He and Simoni shed the field to top the Mortirolo together, and stayed away together until the final 2 kilometers of the Passo Aprica, when Basso just flew away from the 2-time Giro champion. At 2:51, Damiano Cunego led in José Enrique Gutierrez, who cemented his 2nd place overall. Defending champ Paolo Savoldelli could manage no better than 5th, at 6:03, and that moves Cunego into 4th overall, dropping Savoldelli into 5th. Barring a lightning strike, Basso will win his first Giro d'Italia championship tomorrow in Milan. Team Milram's Alessandro Petacchi had made no secret of his desire to take today's Giro d'Italia Stage 2, from Mons to Charleroi. As the peloton approached the finish line, his Milram team executed the plan to perfection, as his teammates slowly fell off, keeping the pace high enough to discourage opportunistic attacks, and launching Petacchi with 200 meters to go. But today, the sun didn't rise in the East, the roadrunner didn't escape, and Petacchi couldn't finish out the sprint. Instead, Davitamon-Lotto's Robbie McEwen, following Petacchi's wheel, was able to come around and take the first road victory of the 2006 Giro. T-Mobile's Olaf Pollack (who took the sprinters' points jersey at the Tour of California) was 2nd, Paolo Bettini of QuickStep was 3rd, and Petacchi was 4th. Leonardo "L." Duque of Cofidis rounds out the top 5. Maybe there's still some life in the old-timers: McEwen is 33, Pollack, Bettini, and Petacchi are 32. With the sprint finish, there was no significant change in the overall, where Discovery Channel's Paolo Savoldelli (celebrating his 33rd birthday) still leads Française des Jeux's Bradley McGee by 11 seconds, and José Enrique Gutierrez by 13 seconds. 3) Paolo Bettini, Quick Step, s.t. 4) Alessandro Petacchi, Team Milram, s.t. 5) Leonardo Duque, Cofidis, s.t. 6) Tomas Vaitkus, AG2R Prevoyance, s.t. 7) Alberto Loddo, Selle Italia, s.t. 8) Koldo Fernandez, Euskaltel-Euskadi, s.t. 9) Axel Maximiliano, Ceramica Panaria-Navigare, s.t. 10) Graeme Brown, Rabobank, s.t. Click for AP cycling photo wire. Unlike the others, this will be current when you click through. I think this makes the Swiss team, likely to be led by American Floyd Landis, the first team to announce a final lineup of nine riders. Many of the other included teams have narrowed the field to a "pre-selection." Update (6/12): Going by Botero's performance at the Dauphiné, he might be the more likely team leader. Landis has said in the past he wasn't sure he was ready to lead a Tour team this year. Cycling4all.com has a running tally of likely Tour starters. US Postal took the team time trial. Armstrong is in yellow, and the real leaders will start to emerge on GC. Phonak finished 2nd on the day, 67 seconds back, but that will be capped at 20 seconds. Illes Balears-Banesto, at 1:15, are capped at 30 seconds, and so on. 2. George Hincapie (USP) at 10"
3. Floyd Landis (USP) at 16"
4. Jose Azevedo (USP) at 22"
5. Jose Luis Rubiera (USP) at 24"
6. Jose Enrique Gutierrez (PHO) at 27"
7. Viatcheslav Ekimov (USP) at 30"
8. Tyler Hamilton (PHO) at 36"
9. Santos Gonzalez (PHO) at 37"
10. Bert Grabsch (PHO) at 41"
2) Hamilton (Phonak) at 36"
3) Jens Voigt (CSC) at 43"
4) Ullrich (T-Mobile) at 55"
Bramati and a few others were dropped by their teams during the TTT, and had to straggle in alone (or in one pair's case, with a teammate). Eddy Seigneur of RAGT was also dropped, but couldn't finish within the time limit, and was eliminated. José Enrique Gutierrez Cataluña took overall leadership of the Dauphiné Libéré on Tuesday, finishing 7 seconds ahead of the field. The gap moved Gutierrez 8 seconds ahead of Euskaltel-Euskadi's Iban Mayo, 9 up on Phonak teammate Tyler Freaking Hamilton, and 10 seconds up on Lance Armstrong, and Phonak's Oscar Pereiro and Cyril Dessel. American Levi Leipheimer of Rabobank is 10th, 20 seconds back. Gutierrez said after the stage that he made a break after hearing that Hamilton was having a rough day. Hamilton for his part said he had felt the effects of not racing for more than a month as he finished 42nd in the stage, though little damage was done in terms of time as he managed to get back to the peloton on the descent. "The first stage of over 200km on Monday wrecked my body and I need five or six days hard racing to really get back in the groove. "I didn't want to really push it as there is the Tour de France to come," added the 33-year-old, who finished fourth in last year's Tour despite fracturing his collarbone.